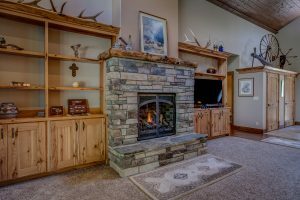 Homes for sale in North Idaho: WARM & COZY EDITION! It’s that time of year again! Fireplace season! These are the days the first question asked about a home listing: does it have a fireplace? Not only do fireplaces do a great job of taking the edge off of these cold evenings, they are essential for hanging stockings and providing Santa his preferred point of entrance. It’s also a great gathering area for family, and let’s face it, dogs love basking in the heat! If you found your dream home and it doesn’t have fireplace, we can help you to get an estimate from a professional to see if it is realistic to get your dream fireplace/woodstove. Wood stoves and fireplaces are the main source of heat for some local homes as well, although these days this is usually true just for older homes on acreage with timber where firewood is plentiful! If you do fall in love with a home with just a fireplace/woodstove for heat and don’t want to worry about having enough cords of wood to get you through the winter, we can get different contractors to estimate additional sources of heat to see if that is a solution for you. Ready to get toasty?! Here’s a link to local homes currently for sale that have fireplaces. Whether it’s a cabin in the woods, spacious home in-town, or lake-side estate – we can help you with that!